In the year that will soon pass us by, the bulls reigned. The BSE Sensex has surged 26.80 per cent since the start of the year and closed at 33,724 points on November 27. Many events have been pushing the surge in stock indices. An upgrade in India's sovereign credit rating - the first in 13 years - by a notch to "Baa2" by Moody's was given a thundering applause by equity markets. Economic reforms such as implementation of the Goods and Services Tax, expansion of the tax base, infrastructure building, bank recapitalisation and approval to the Bharatmala project to develop 83,677 km roads at an investment of `6.92 lakh crore by 2022 have lifted the spirits of investors. This, along with stable macroeconomic indicators, has given investors the confidence to put their money in stock markets. Another factor behind peoples love for equities is the poor returns given by other investments such as gold and real estate. 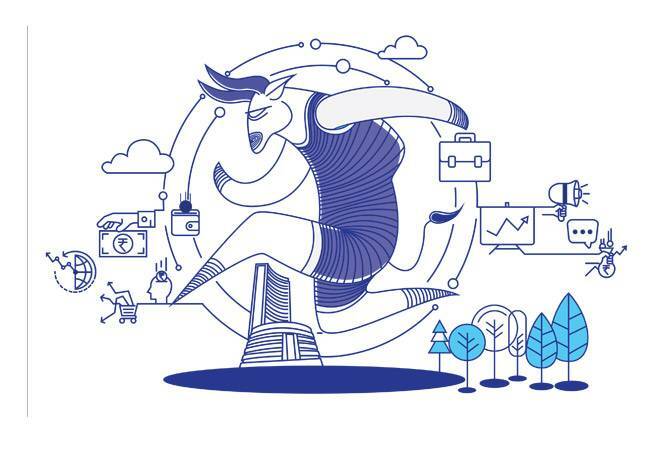 The rally has been powered by domestic institutional investors such as life insurance companies, mutual funds and portfolio managers, who together pumped in a net `79,865.96 crore during the year up to November 29, 2017, considerably higher than the `40,080.69 crore that they invested last year. The number of equity mutual fund folios (investment numbers) rose from 4.08 crore to 4.58 crore during the period. In stark, contrast, foreign institutional investors sold equities worth `33,209 crore between January and November 29, compared with `11,838 crore that they had sold in 2016. Though equity markets have risen sharply during the year, backed by strong macroeconomic numbers, the missing piece of the puzzle is poor growth in earnings of companies. As a result, valuations look stretched. "Nifty valuations are almost near their highs, while earnings growth has been in low single digits in the first half of 2017/18. Going forward, while valuations have limited room for expansion, much of the price appreciation should come from the long overdue earnings expansion," says Hemang Kapasi, Portfolio Manager, Sanctum Wealth Management. Valuations are stretched and a correction that can bring them down to reasonable levels is looming, say experts. 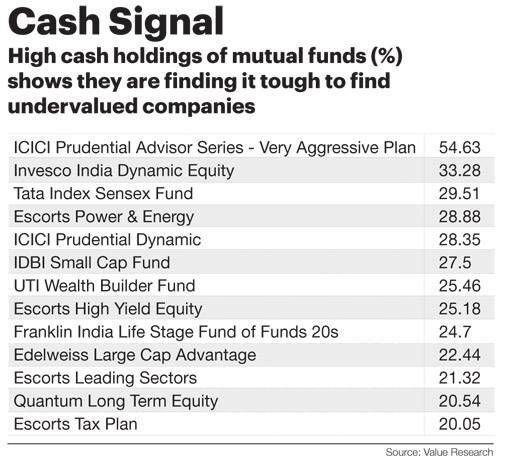 If cash holding of mutual fund schemes is any indication of fund managers anticipating a fall in markets and shortage of undervalued companies, a total of 29 schemes are holding more than 10 per cent assets in cash, awaiting a correction to invest, as per the latest data with Value Research dated October 31, 2017. "Valuations are expensive and there is a tremendous downside potential. 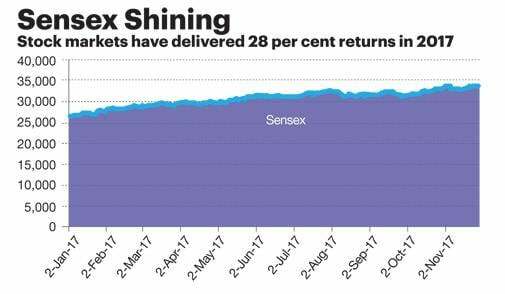 The growth during 2018 could be in low single digits," says Nilesh Shetty, Associate Fund Manager of Quantum Long Term Equity Fund, which is holding 20 per cent assets in the form of cash. Though there may be immediate pain, long-term gains are likely. A few sectors look promising due to recovery and others as they have touched bottom. "Though there may be a correction over the next six-nine months, our view is very positive from the perspective of the next 12 months as there is gradual infrastructure recovery. Now that bank recapitalisation is behind us, a clean-up of the system will start. Also, incremental bad news is not having a meaningful impact on pharmaceutical stocks, indicating that the sector has bottomed out," says Gautam Duggad, head of research at Motilal Oswal Securities. For the sentiment to remain positive, all eyes are on corporate earnings and other parameters. "In the domestic market, there are a broad range of indicators, but one should keep focus on tax collections by the government after the GST exercise, resolution of bank NPAs as well as the trend going forward, and corporate earnings, which will eventually determine interest rates and the government's ability to continue with reforms," says Kapasi. The rural consumption-led companies look promising. International brokerages have also been anticipating earnings growth. Late in November, a Morgan Stanley report said, "The combination of recovery in end demand and easing of credit constraints should pave the way for a private capex recovery in 2018, thereby raising our confidence that India will be on a sustained growth cycle in the coming years." It forecast that GDP growth will improve to 6.7 per cent during 2017/18 to 7.5 per cent in 2018/19 and 7.7 per cent in 2019/20. The positives outweigh the negatives and, hence, the euphoria. But the potential spoilsports include surge in oil prices, political developments and even worries about interest rates. "For India, rising crude oil prices would increase fiscal deficit, as the government is not likely to go back on the reform process (in the petroleum sector). With every $1 rise in crude oil prices, the import bill rises nearly $1.33 billion for the world's third-largest consumer. While it's early to start re-thinking the fiscal math, it's certainly on the radar as a cause for concern," says Kapasi. Though the Bharatiya Janata Party victories in several state elections have reduced the fear over political uncertainty, the 2019 elections are on the radar for most investors, both domestic and international. "The 2019 election could present itself as a black spot as politically the confidence that has been built up is mostly perception-driven. There could be a political backlash if the BJP loses in any key state and the reform pace is affected," says Shetty of Quantum Asset Management Company. Some sectors would be better placed to gain from the positives than others. We asked experts to help you ride the right horses for 2018. Investors should largely focus on domestic growth-oriented sectors that could be the beneficiaries of the government's reforms process, says Kapasi, adding, "Sectors benefitting from the unorganised to organised shift, higher electrification and those benefitting from the government's focus on infrastructure spending in roads, rail, defence and affordable housing may be good placed to be in." Businesses exposed to the global agro-chemicals market too seem to be a favourite among fund managers and stock pickers. With recapitalisation of banks and expectations of corporate earnings momentum, banks with a large corporate loan book should be considered. "Corporate-focussed banks, select companies in the infrastructure space such as KNR, Ashoka Buildcon and L&T can be looked at," says Duggad of Motilal Oswal Securities. Valuations of pharmaceutical and IT stocks are reasonable and offer upside, says Shetty of Quantum Advisors.